Let’s take a look at how to configure MSTP, Multiple Spanning Trees Protocol and in this example. 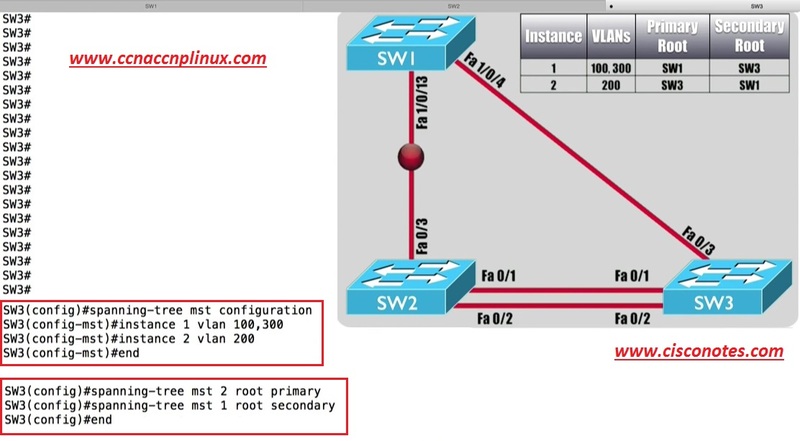 Let’s say that, we want to create a couple of Multiple Spanning Trees Instances, and we want to assign Vlan’s 100 and 300 to instance number 1, and let’s assign Vlan 200 to instance number 2, then we can say that Switch Sw1 is going to be the Root, The Primary Root for Instance 1 and the Secondary Root for Instance 2, then we can go to Switch Sw3 and say “it’s gonna be the Primary Root Instance 2 and Secondary Root for instance 1, to begin with and we need to visit each Switch, this information is not automatically propagated, but on each Switch we need to defined our instances. That’s the first step, we have now defined identical instances and Vlan’s Mappings to those Instances each of our Switches, now let’s go to Sw1 and say that, it is going to be the Root specifically the Primary Root for Instance 1 and we will say, it can be Secondary Root for Instance 2, to do that we need go to Global Configuration Mode. Let’s go to Switch Sw3 and say that, it’s gonna be Primary for Vlan 200, another word, Primary Root for instance 2 and it’s gonna be Secondary for instance number 1. We have, now defined our MSTP or MST Configuration on all over our Switches, their identical configuration, that we want to be Primary and Secondary Roots for the instances. ü we have now enabled MSTP on all our switches. And we can see that, the Switch is in MSTP Mode, and we can see our 3 instances, remember there was MST0, that not something that we create, it’s instance 0, and we can see that we created Two instances 1 and 2. We can see here that, we didn’t set Name and Revision Number, it’s still works but it’s a good practice to set those, especially when we start changes, we would want to start incrementing that Revision Number and if we did have Multiple Region, we would want to them have unique names. Now go to Global Configuration Mode, and Specify Name and a Revision Number. Remember, we said that when we are exchanging information with other switches in our Region, we are not sending the entire Mapping Table, we were sending a digest a Hash digest of that Table. 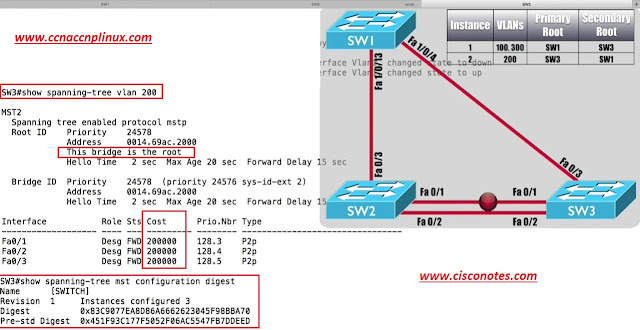 Here we get to see that digest, if we tell a neighboring switch that the name of my Multiple Spanning Trees Protocol configuration is SWITCH, our Revision Number is 1, and here is my digest if that information matching on those neighboring switches, then those switches would know their part of the same Multiple Spanning Trees Protocol Region, and by the way, we can influence our Path Selection, similar to how we did it with PVST+. We can directly manipulate a Port Cost, notice the Cost are different then, we had with PVST+, the valid range of Cost value is anywhere from 1 to 200 million, here based on Interface Speed of 100mpbs, we got a Cost of 200000, however the Port identifiers that we talked about previously, they are the same, and if we need to we can manipulate those Port ID’s to influence Path Selection. 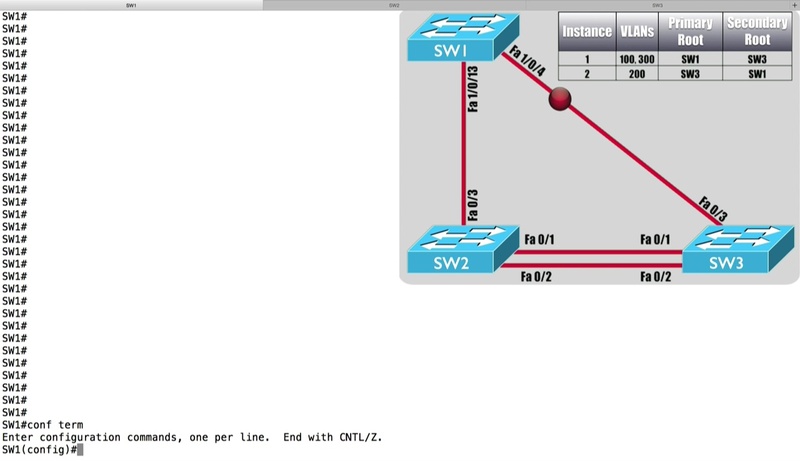 And we wrap up this demonstration of MSTP with a design best practice and that is Cisco recommendation that, we using MSTP on our switches, that those switches be interconnected with Trunks, and here is big difference. 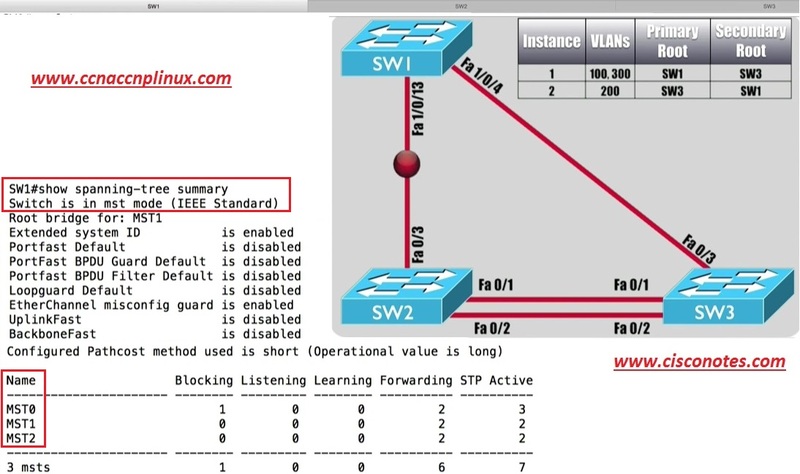 Cisco Strongly recommends that, we do not PRUN any of Vlan’s of those Trunks, even though it’s fine to do that with PVST+, if we start Pruning Vlan’s of the Trunks interconnected our Switches, that could leave to connectivity issues with MSTP.